Ruben and Michelle met through a mutual friend. Although Michelle didn’t like Ruben too much at first, he won her over and they fell in love. He proposed on a vacation to the Dominican Republic, in front of her entire family. 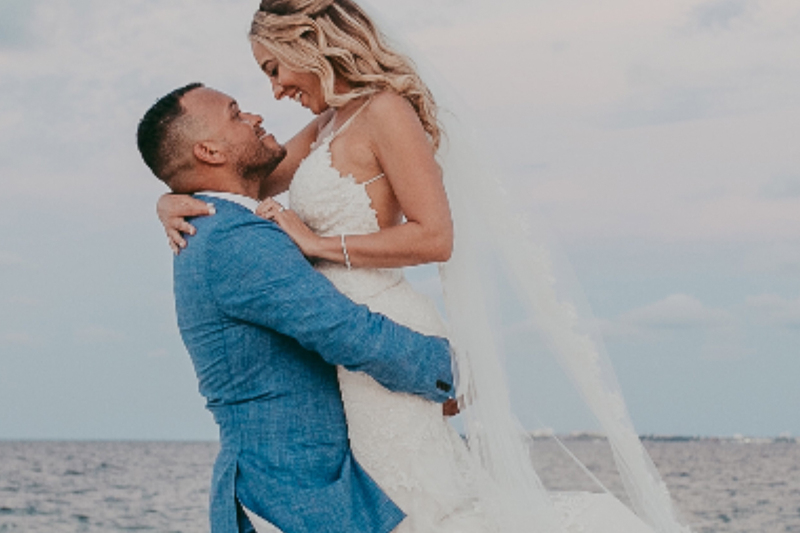 They both knew they wanted a destination wedding because they loved the beach and wanted to make a vacation out of it. Together with their Destify agent, Brittany, they chose the Finest Playa Mujeres resort in Mexico. Michelle said, “We loved the modern and clean look the hotel had”. The couple planned for a beach ceremony and more, and once on-site they were happy with the delicious variety of food available, and the amazingly attentive staff. On the day of the wedding, the couple agreed that the day went by so fast. Although the mosquitos had shown up as uninvited guests, and Michelle had a temporary hiccup with her dress not bustling, the ceremony turned out beautiful. The guest list had a great turn out and Michelle said the best part was seeing all of their loved ones there for us. At the end of the day, it’s important not to stress the small stuff. The couples’ advice is to stay focused, as it’s really all about you and your significant other, so make the most of it. I loved walking down the aisle with my dad, and seeing all of our loved ones smiling and crying, so happy for us.